L to R: E.K. 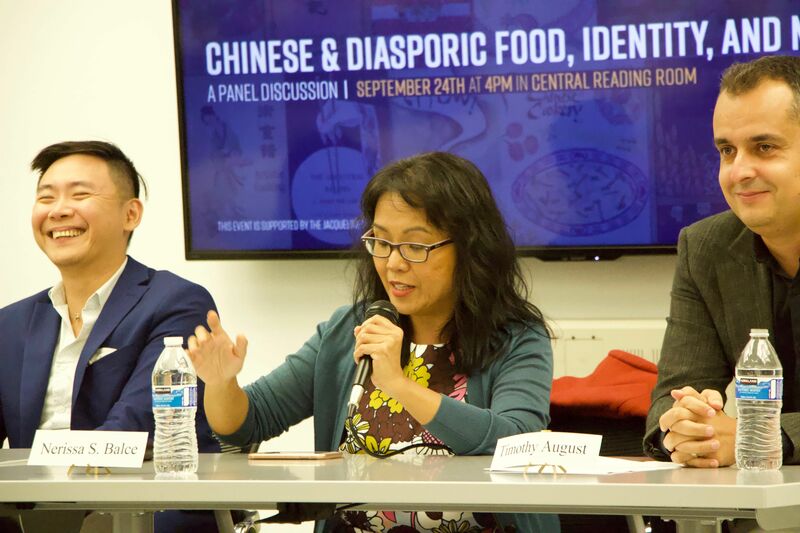 Tan, Nerissa Balce, and Timothy August: Chinese and Diasporic Food, Identity, and Memory, 9-24-18. On September 24, SBU students, faculty, staff and neighbors gathered for a panel discussion on “Chinese and Diasporic Food, Identity, and Memory: A Panel Discussion.” Dr. Jacqueline M. Newman delivered opening remarks and SBU professors and scholars Timothy August (Department of English), Nerissa Balce (Department of Asian and Asian American Studies), Shirley Lim (Department of History), and E.K. Tan (Department of English) discussed food, memory, and identity in Chinese, diasporic, and colonial contexts. This special event highlighted the Jacqueline M. Newman Chinese Cookbook Collection, fostered an engaging dialogue on this under-documented topic, and celebrated the Mid-Autumn Festival. 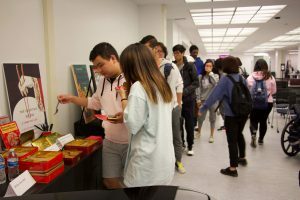 Afterward, all were invited to sample a variety of mooncakes and view a display of mooncake molds, books, and artifacts from the Newman Collection. The program was organized and hosted by Stony Brook University Libraries, Special Collections & University Archives, and the University Libraries’ Equity, Inclusion, and Diversity Committee. The event was supported by the Jacqueline M. Newman Endowed Fund. 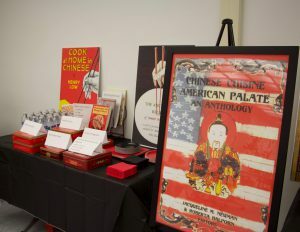 In 2002, Stony Brook University Libraries was gifted the Jacqueline M. Newman Chinese Cookbook Collection, the largest cookbook collection of its kind in the world. Dr. Newman established an endowed fund to support the collection and has made several subsequent donations of books to the University Libraries. 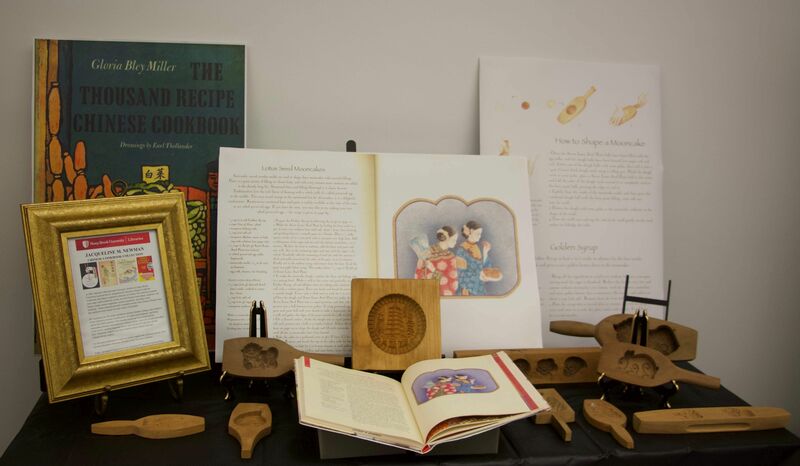 Part of Special Collections, the Newman Collection features more than 5,000 cookbooks, books on food Chinese food culture, medicine, and history; haute cuisine magazines; archival materials; and audio visual items. These unique and scarce research materials provide a valuable record of the Chinese diaspora. All are welcome to consult and explore the collection. Mooncake mold display: Chinese and Diasporic Food, Identity, and Memory, 9-24-18. Mooncakes and more: Chinese and Diasporic Food, Identity, and Memory, 9-24-18. 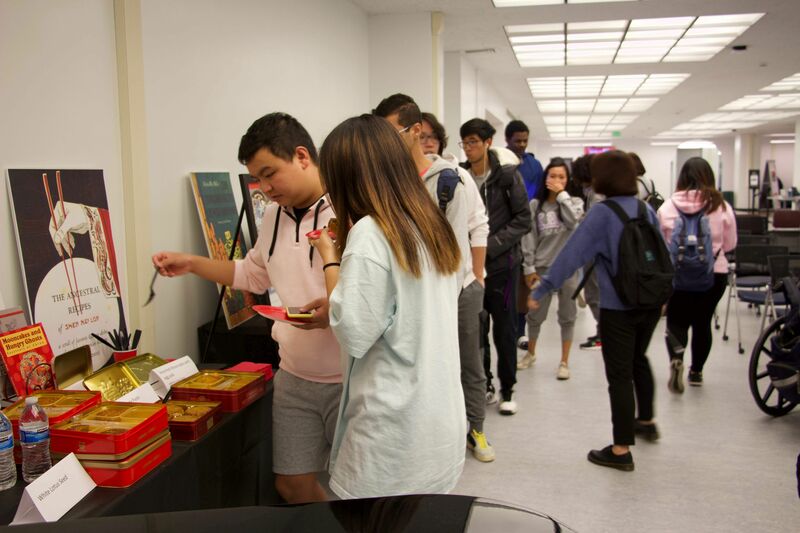 Reception with mooncakes: Chinese and Diasporic Food, Identity, and Memory, 9-24-18.